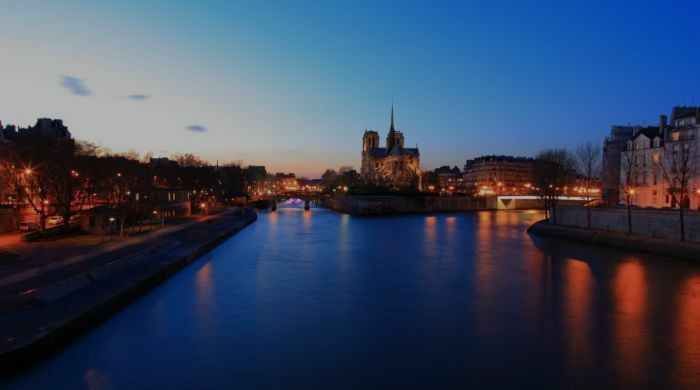 At the centre of Paris, on Ile de la Cité, discover two of the capital’s historic monuments. Start at Sainte-Chapelle, a jewel of Rayonnant Gothic architecture, built by Saint Louis at the heart of the former royal residence, Palais de la Cité, to house the crown of thorns worn by Christ. Discover the chapel’s unique stained glass windows, which fill the air with colour and light. A few metres away, continue your journey by visiting the Conciergerie, which contains exceptional Gothic rooms from the capital’s first royal palace and once served as a prison for the law courts during the French Revolution. At the end of the 18th century, a large number of those tried by the Revolution’s courts were imprisoned at the Conciergerie, including Marie-Antoinette. At the invitation of the Centre des monuments nationaux, Stéphane Thidet has created for the Conciergerie a piece of art work (entitled ‘Détournement’ or detour in English) that is as daring and poetic as his recent installations, ‘Sommeil’ (dormant), a frozen forest twirling on the square of Paris city hall for the capital’s night-time arts festival in 2016 and ‘Bruit blanc’ (white noise), a frozen sculpture in one of the groves of the château of Versailles gardens this winter. Continuing his exploration of nature, Stéphane Thidet will divert water from the Seine through the Conciergerie, making it twist and turn as it travels within this monument, and then return the water to the river, thereby moving the natural course of the Seine. Echoing the flood of 1910, which left its mark on the columns of the Conciergerie, the artist wanted water from the river to enter the building once again but in a peaceful and controlled manner. Using a carefully-crafted technical structure, Stéphane Thidet will create a temporary meander that will penetrate the Conciergerie. All members of the public will be able to view this installation and gain a deeper understanding of the relationship between the Seine and Ile de la Cité thanks to a diverse culture programme: a face-to-face meeting with Stéphane Thidet, a conference with the historian, Isabelle Backouche, family visits and accompanied tours. It will also be possible to visit the installation, exceptionally, at night on 9 May and 6 June, and, for the first time in 2018, the whole of the Conciergerie will be open for ‘Museum night’ on 19 May. This exhibition will be accompanied by an essay in ‘Un artiste / Un monument’ (Éditions du patrimoine) written by Rebecca Lamarche-Vadel, an art critic and curator at Palais de Tokyo, and due to be published in the spring. Both monuments are open every day from 9.30 a.m. to 6.00 p.m. (Sainte-Chapelle is open from 9.30 a.m. to 5.00 p.m. from November to February). Closed on 01/01, 01/05, 25⁄12. The ticket is valid for one year as from the date of issue. QUEUE-FREE ACCESS! Free for those under the age of 18 (with their family but excluding school groups), those under the age of 26 who are European Union nationals or who live in a European country and FOR EVERYONE ON THE FIRST SUNDAY OF THE MONTH FROM NOVEMBER TO MARCH. Please note that if you select, ‘collect tickets at shop’ (‘retrait magasin’ in French), the ticket must be collected at one of our collection points, not at the monument.